Today we are gathered by the participants of the World Federation of Traditional Archery (WTAF Ukraine), to brightly and cheerfully close this incredible archery season 2018. The year 2018 was marked by new events, bright discoveries and incredible experiments in the world of archery, crazy ideas of WTAF Ukraine, which open up new facets in the direction of archery, incredible efforts and great love for achery, and of course, new people who discovered for yourself this vast and fascinating world of archery. 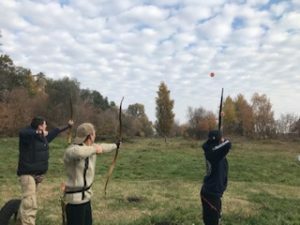 WTAF Ukraine – for the fascinating world of archery! This entry was posted in Interesting, Events, NEWS by Marina Glievaya. Bookmark the permalink.